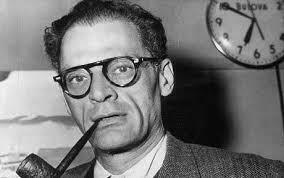 Arthur Miller Essays on the leading American playwright of the 20th century. Arthur Miller (1915-2005) was one of the leading American playwrights of the 20th century. Miller is perhaps best remembered for his plays Death of a Salesman and The Crucible, but he also wrote the screenplay for the 1961 film The Misfits, the last film both Marilyn Monroe and Clark Gable made. Miller was awarded the Pulitzer Prize for his work. Born in New York City, Miller was the son of Polish Jewish immigrants, and worked his way through the University of Michigan, where he studied journalism before writing his first play and switching to English. In 1938, Miller joined the Federal Theater Project, part of the New Deal, and began writing radio plays. His 1946 play All My Sons became a Broadway success, earning a Tony award Death of a Salesman followed in 1949. During the height of McCarthyism, Miller wrote The Crucible, which while set during the Salem Witch Trials, was an indictment of the current political climate. In 1956, Miller divorced his first wife and married film star Marilyn Monroe, for whom he wrote The Misfits. The couple divorced shortly before the film’s premier in 1961, and Monroe died several months later. Miller’s play After the Fall is about the marriage. At the time of his death in 2005, Miller was almost universally regarded as one of the great dramatists of the 20th century, with Broadway theaters darkening their lights as tribute. Stereotype of a Salesman in Death of a Salesman research papers look at how Arthur Miller uses the typical stereotype of Willy Loman as a Salesman. Paper Masters writes custom essays on Arthur Miller and discuss the leading American playwright of the 20th century.